A break in continuity as I am spending some time away from my sewing machine. I have worked hard to ensure that there will still be new blog posts and have several different projects to show you over the next week or so. 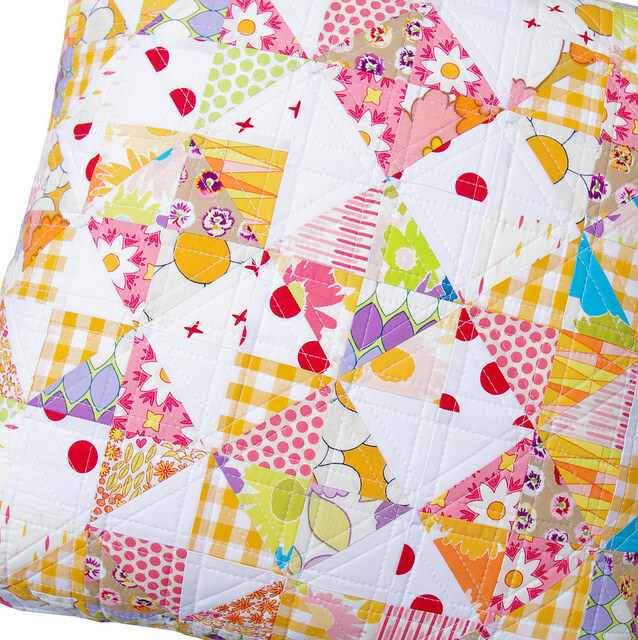 Remember this cute Dreamin' Vintage Flying Geese Quilt that I made late last month? Well, my method of sewing flying geese units does leave a certain amount of scrap fabric / waste; all triangles that I thought were just too pretty and too big to throw in the bin. Save the scraps! And so I chain pieced all of the triangles into half square triangles (HST), using both a light and a dark fabric for each HST unit. I then played with the layout, arranging and rearranging until I was happy, and pieced the units into a patchwork fabric. Not big enough for a quilt but certainly big enough for a pillow; and so I basted and then quilted it with edge to edge straight lines, outlining both sides of all seam lines. A zippered side seam allows for easy insert removal and cleaning. For the back of the pillow cover I have used a single home decorator weight fabric by Premier Prints. This pillow has already sold and is now on the way to a new home. 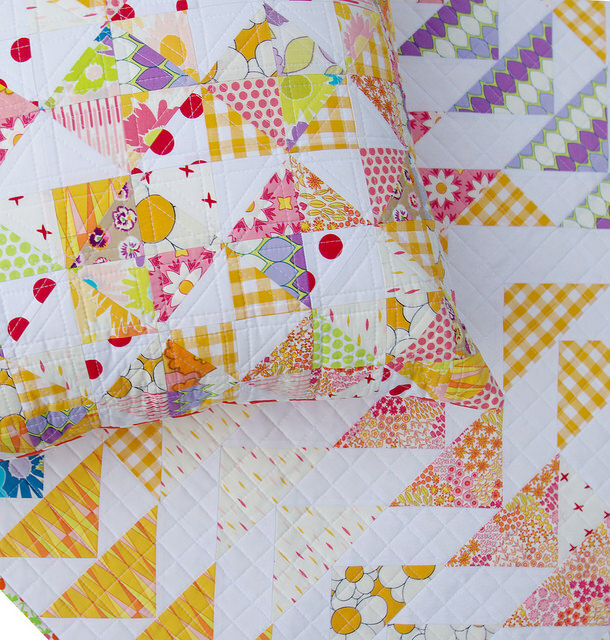 It's been a while since my last Half Square Triangle quilt project and this has my fingers itching to re-visit this easy and versatile unit once again. So nice! A great stash-busting project! Not surprising that it sold so quickly. Looks very cheerful! 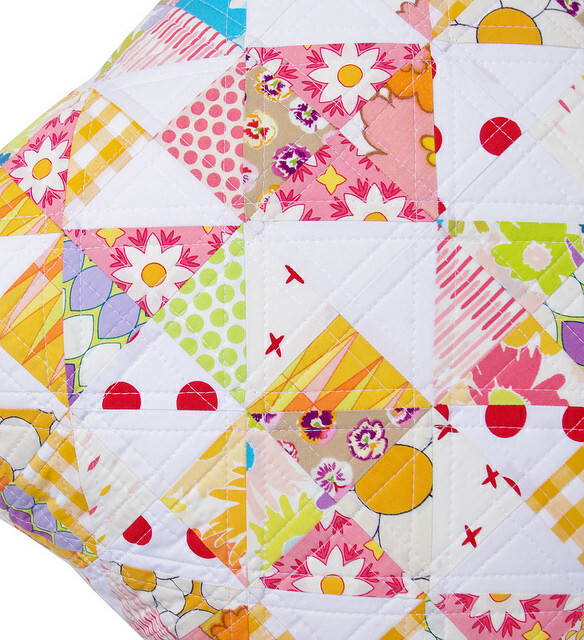 A question: What brand of batting do you use for your quilts? Hi Sona - thank you for stopping by. 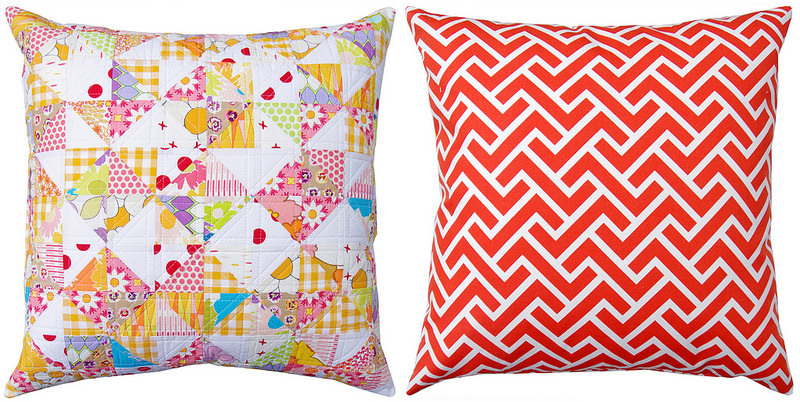 I use 100% cotton batting for my quilts (and quilted pillow covers). It is an all natural product and has low loft. How lovely to make something so beautiful from something that normally might have been thrown away, I always think this is a great life lesson too. 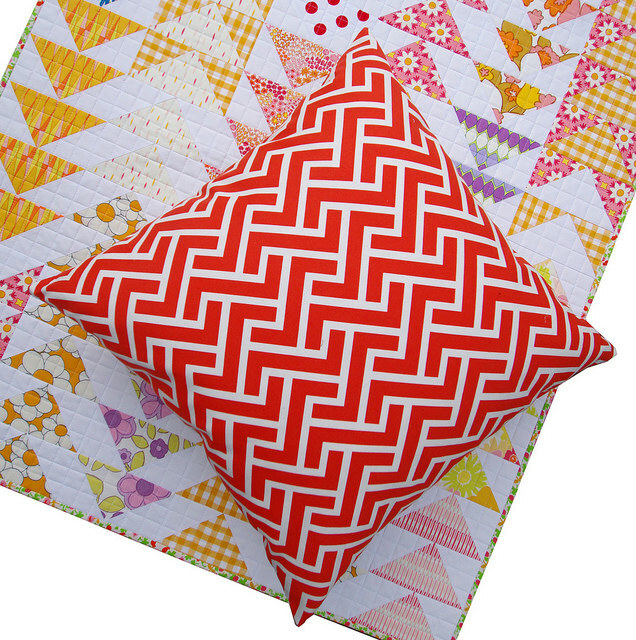 I have a question, when quilting for a cushion/pillow do you put a backing behind the wadding/batting? Thanks for the inspiration you give us. I've a quilt to finish today and then I'm going to have a go at some stash busting! I've got hundreds of strips that I spent hours sorting out - in the sunshine on the patio a couple of weeks ago - so topped up my suntan at the same time! Love that cushion - my favourite kind of patchwork. You're such an inspiration. Enjoy your time away - bet you visit at least one fabric shop????? I love your projects...and colors! Thanks for the inspiration!! PS-Before I cut off the corners of the flying geese I sew a second seam 1/2 inch from the first. After cutting them apart between the stitching, I toss the scrap into a jar by color. Later those little HST blocks can be pressed and cut to size for whatever project I need. It always feels like the next project has a head start ;-) Hope you are having a lovely time away! Lovely pillow! The back is super fun. I am now itching to sew my scraps! Thanks for the inspiration. 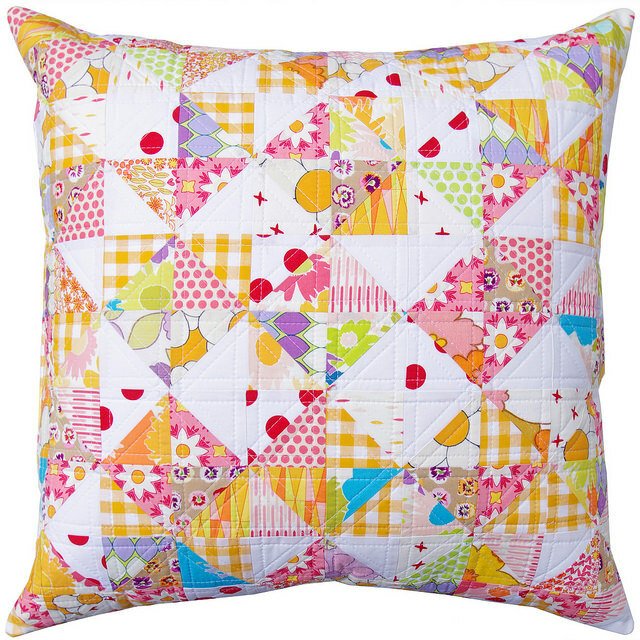 I do not consider myself a "yellow" person, but this pillow is fabulous! great use of the scrap triangles. Will look out for you tomorrow at FOQ, maybe we will spot each other across a crowded room! Beautiful! I will also be at FofQ so will look out for you!